Pattern Description: Zipper-like teeth run up the inside of rounded vertical panels that cover the sides of the pattern. The original manufacturer for this pattern is believed to be Westmoreland (it is found in an early catalog reprint circa 1904) and the original name was Derby. There are some pieces that are heavily iridized. 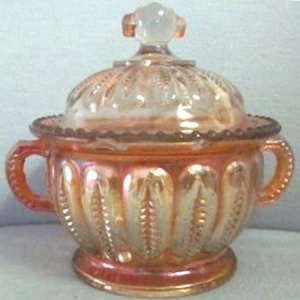 The filial on the sugar bowl has a distinctive ‘ear' on each side of the knob, and handles look much like ears as well and the beaded top of the base is quite unique. There are pieces reported in opaque blue milk glass and crystal.